These leaf design bottle openers are fall favours that your guests will really open up to. Perhaps nothing else signifies autumn quite as perfectly as the falling leaves. Brilliant and crisp, the leaves make a spectacular blanket of colour on the trees and on the ground below. And, these bottle opener fall favours capture the essence of this icon in a lasting and useful way. Each metal bottle opener favour measures 3" x 1.25" and has a cut out copper colour metal leaf perched atop a metal loop bottle opener. 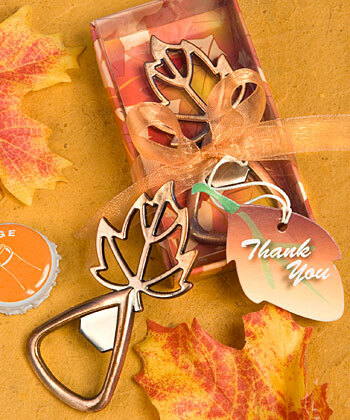 A brilliant choice as fall wedding favours or for any fall themed occasion, each bottle opener comes in a clear topped box with a colourful fall leaf design base, tied with a bronze organza ribbon and attached leaf design "Thank You" tag.